1. The ski village slopes will be functional in 2008. They are currently training a large bunch of local ski instructors on skiing methods of instruction, patrolling and rescue. 3. There will be a complete resort with Hotels, shops and food places near the ski lifts. This will be a first in India, where a complete ski resort with all the bells and whistles thrown in. I cant wait to get my carving set on the slopes. I plan to ping the ski village guys on a regular basis and keep news up to date here. We all had a rollicking time in Manali, Himachal pradesh. 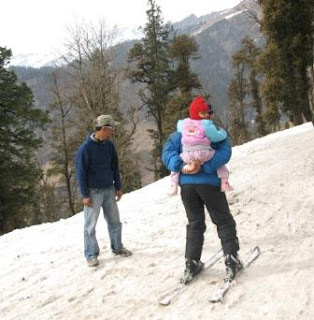 The idea was to have Asmita experience her first snowfall , get her excited about the hills and skiing. The first two days were a let down as the snowfall till then was dismal. Luckily, the rest of the week saw fresh snow and we could go out and ski. And ski we did ! Stopped in Delhi on the way to check out the Taj Mahal at Agra. It was a day trip steeped in history. The place was fascinating and haunting given that I had just finished the book “the Last Mughals”. Check my pics in flickr. I have to mention my dismay (I have gone past being shocked at stuff like this) at the state of the Yamuna behind the Taj. The river was a just a sewage drain ! Black and with plastic and other disgusting flotsam. Agra will have to treat this water ASAP, but I suppose the UP government has other fish to fry given the gruesome stuff getting uncovered in Noida.